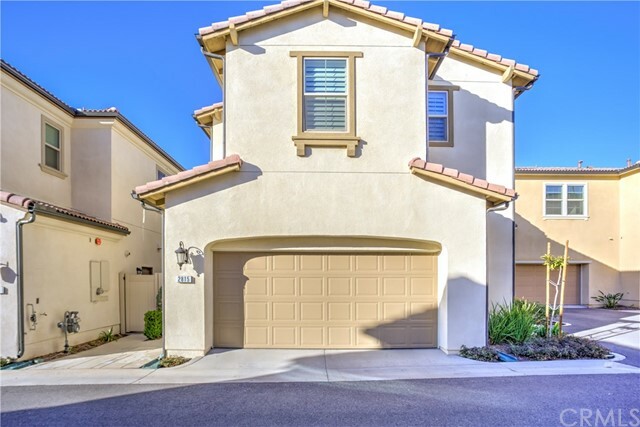 Better than new construction - less than 3yrs old with tons in upgrades * model perfect home is priced to sell fast * gorgeous gated community of terrassa by tri-pointe homes * open concept home has a spacious floor-plan offering 1805sqft with 3 large bedrooms & 2. 5 bathrooms * gourmet island kitchen w/granite slab counters & custom subway tile back-splash, breakfast bar, stainless steel appliances, shaker cabinetry & large dining area * upgraded throughout w/beautiful hard-wood flooring, custom interior paint, plantation shutters, granite slab counters, designer fixtures, base molding & door casings, stainless steel appliances, recessed lighting, raised panel decor doors, ceiling fans in each bedroom & much more * two large bedrooms upstairs w/ shared jack n' jill bathroom * large master bedroom suite w/walk-in closet and master bath offers dual sinks and large walk-in shower w/seating area * upstairs laundry room w/utility sink & overhead cabinetry * over-sized 2 car attached garage w/ upgraded flooring, storage cabinets & large storage nook * decorative concreted backyard surrounded by block wall & vinyl fencing * highly desirable gated community offers a sparkling pool & spacious park area * walking distance to brand new starbucks shopping center & close to shopping, dining, dos lagos & ez freeway access * * * this is a completely finished gorgeous home, move-in ready & close escrow fast * * submit all offers!!! For more information or make an appointment to see property ID IG19083563.